The inspiration and sense of stewardship aroused by an iconic photo of Earth from the Moon is needed now more than ever. It takes an eye for a certain type of detail to look at a photo of the bejewelled Earth hanging in the sky over the sterile terrain of the Moon and see, not the fragility of humanity’s only home, but a barren lunar crater. But look carefully and it’s there. And now that crater has a new name: Anders’ Earthrise. The Working Group for Planetary System Nomenclature of the International Astronomical Union (IAU) approved the naming of the crater — and another nearby, called 8 Homeward — to mark the 50th anniversary of the Apollo 8 mission that orbited the Moon, and more specifically, the famous photograph taken from on board of Earth rising over the lunar surface. Snapped on 24 December 1968 by astronaut William Anders, Earthrise is often labelled as one of the most important and influential photographs in science, if not all of human history. Needless to say, the status of the image is not down to the circular dent captured in one corner. Instead, it’s because the photograph — which seems to show Earth rising above the Moon’s horizon — has been credited with starting the environmental movement. Readers of Rachel Carson’s book Silent Spring — which highlighted the damaging impacts of pesticides on the natural world six years earlier — might argue with that common trope. But it’s undeniable that Earthrise was profoundly important in raising awareness and focusing minds. For the first time, people could see their planet framed against the black emptiness of eternal space and appreciate its technicolour beauty as well as its utter insignificance in the Universe. The view of Earth from space is much the same now as it was then. (Just witness the stunning images released earlier this year from the GOES-16 satellite, which show the planet in extraordinary detail). But how we think about such images has drastically changed. For many millions of people, the end of 2018 sees a better, more prosperous world than the one the Apollo 8 astronauts returned home to 50 years ago. Human progress, driven by advances in science, medicine and technology, has radically improved average living standards, health and life expectancy. But Earth itself is panting to keep up. Only two months ago, the Intergovernmental Panel on Climate Change issued its most urgent warning yet about the effects of climate change, warning that a temperature rise of even 1.5 °C — which most experts agree is inevitable — will bring devastating droughts and floods. It’s likely to be much worse than that, however. Last week, the world’s politicians met in Poland to discuss next steps on a global climate agreement that could be the last, best hope to stem climate change. The deal will make insufficient change to the amounts of damaging greenhouse-gas emissions we hurl into the atmosphere. Powerful images show what is at stake. But they also show what we can still achieve: that we do not have to be passive observers, trapped by the scale and magnitude of the Universe and its problems. We can act. We can make things happen. 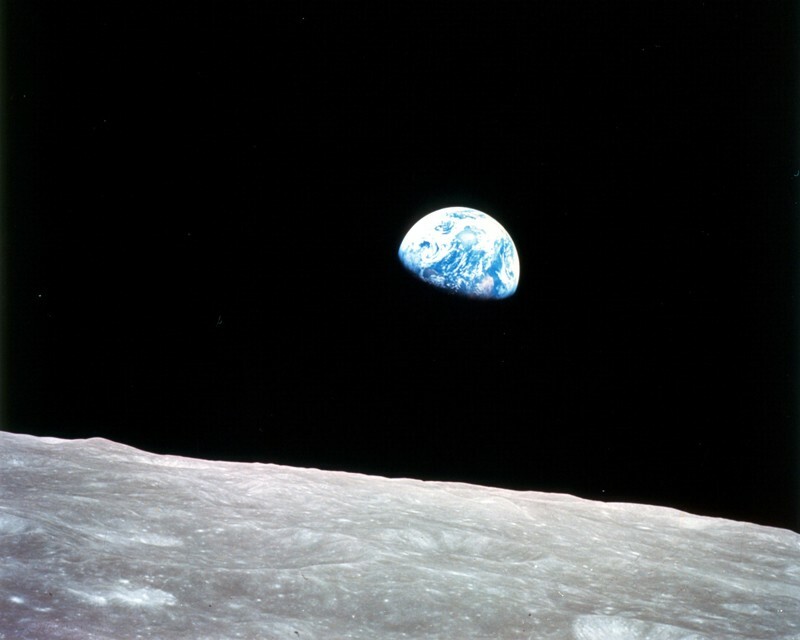 Take Earthrise, the picture and the phenomenon. We did that. The Moon is tidally locked to Earth and that fixes the planet’s position in the lunar sky. Earth doesn’t rise from the Moon and only seemed to do so for the Apollo 8 astronauts because their craft was speeding above the surface, gradually revealing more of Earth as it travelled. Even as the planet hung there in the blackness of infinity, the people who saw it were moving forwards. We still can.